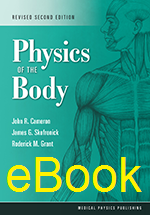 Physics of the Body provides a wealth of information on the relationship between physics and the functions of the various systems of the body, such as the eyes, ears, lungs, and heart. The authors’ enthusiasm and good humor have delighted readers for years. Although it was written primarily as a text for students who have some knowledge of elementary physics, the book is interesting and understandable to any person who is curious about how the body works. This book is intended primarily for students who plan to make a career in some field of medicine. The mathematics is at the algebra level. Various problems are included to test the reader’s understanding of the concepts presented. This revised edition features an updated page layout and sharpened images.